I thought Mum would go on forever. It never occurred to me that she would die. I had planned on her living at the nursing home for at least another ten years. Twelve weeks ago, Mum had a series of minor falls. She just had a few bumps and scratches but on one occasion she went to hospital and had a brain scan just to be sure as she'd hit her head. 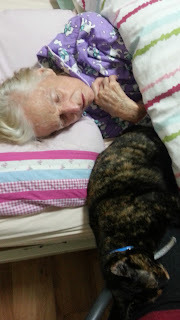 About six weeks ago, in June, Mum started to sleep a lot more. I stopped taking her out in the car because I could never wake her up enough. Instead I put her in the wheelchair and took her upstairs to the nursing home library which has lovely views of the escarpment, and made her cups of tea, which she rarely drank. During this time I was making a mental note of all the things she'd never do again and I felt sad. I knew she'd never come to my house again and sit on the veranda drinking tea. She'd never go out in the car again. She'd never have another conversation with me. Three weeks ago the nurses put a wheelchair in her room to take her to the dining room as she had stopped walking around independently. At meal times she was more or less still asleep but could be roused enough to get her to eat, but with her eyes closed. I think a stroke had affected her level of consciousness. I started to visit more often as it seemed to me she was dying, though the nurses didn't think she was. I started to complain to them that she was always asleep when I visited and they called the doctor. He decided to reduce her medication to see if she could be woken up. After a few days she still hadn't woken up and it was clear to me that she wasn't asleep, but unconscious, and had been for weeks. I took a cat in to visit her to cheer her up. I think she was aware the cat was there. She was beginning to refuse food, too, shaking her head and gritting her teeth. One of the last things she said to me, a few weeks ago, as I was trying to feed her one Sunday night, was, "Don't do this to me Louise." She meant 'don't make me eat'. There was a time a couple of years back when she rarely recognized me but the last few weeks she always knew who I was. The nurses decided to call in the palliative care team a few days ago. I kept feeding her ice cream which was the only thing she was prepared to eat, until Monday 13th July. That's when her level of consciousness was so low that I couldn't wake her enough to get her to eat anything. From Monday to Wednesday, she was on a buprenorphine pump as she had been quietly moaning and may have been in pain. She had pointed to the top of her head previously when I asked if anything was hurting. This could possibly indicate a stroke. When she was asleep, her eyes were open most of the time, but I think she was almost completely blind by the end. On Tuesday I called Father Ross Naylor, RAAF chaplain, relieving at the local church. Coming back from lunch I found him sitting with Mum, holding her hand and singing the Galilee Song. to believe in falling rain as I travel deserts dry. On Wednesday morning, 15th July 2015, one of the nurses rang me and said her breathing had changed and had become laboured. I went straight there and though her breathing wasn't all that noticeably different, it was a bit heavier. My son, daughter and son in law came soon after and we stayed with her all day. I noticed that occasionally her breaths were further apart. She'd stop breathing for a few seconds, throughout the day, from time to time. Every time she'd stop breathing we'd hold our breath too, waiting to see if she had died. We put on the radio, ABC classical music, which she loved. At 11.40 p.m., she took a long deep breath and stopped breathing. We all stood up and held onto her hands. There were a couple more breaths a few seconds apart and then she was gone. We stayed with her for an hour and then we went home. It's been a week and it's very surreal. The funeral is tomorrow. it seemed surreal when my husband passed away also over a year ago. It was nice that your family were with you, to be with her in her final moments so she didn't go alone. If possible, please share your thoughts in the coming days, the emotional process of dealing with this loss of a loved one and all that follows. Its sort of a taboo subject but it can be so helpful to others. bitter-sweet. In many ways all of mom's children were happy to see her go. We didn't have to endure all of the stages that you had to go through. She passed at such a fun stage - and we have such great memories. And every day we miss not being able to call or go visit her.